I spent a short time observing iv preparation in two separate, distinctly different pharmacy environments in the weeks leading up to the new year. One was a traditional iv room in a large acute care pharmacy with multiple pharmacy technicians and pharmacists putting out hundreds of compounded sterile preparations (CSPs) per day. The second was a segregated compounding area in a satellite pharmacy with one pharmacy technician and one pharmacist using a glove box to prepare STAT and first dose CSPs to critical care areas. Neither area utilized technology for CSP preparation, instead opting for the good ole fashioned syringe pull-back method (1). 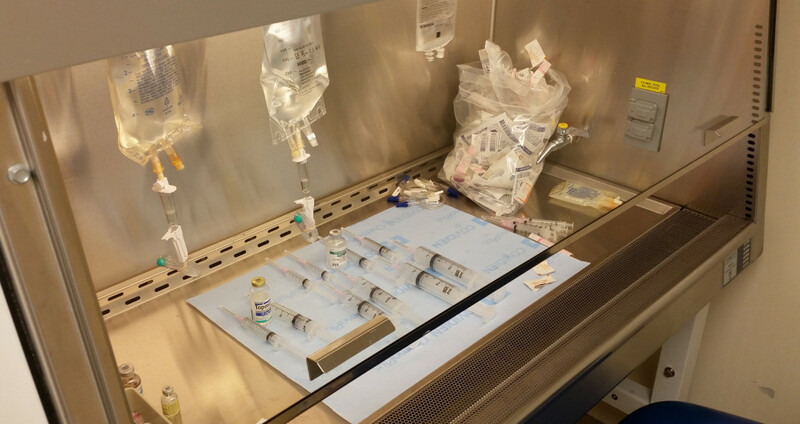 In the case of the traditional iv room, I observed instances of up to twenty different CSPs with empty vials and syringes laid out awaiting pharmacist verification. In the segregated compounding area with glove box, CSPs were typically prepared one at a time or in small batches. Wrong drug selection – This may be the most common error seen in iv rooms. In this particular case, the technician used a vial of potassium phosphate (KPhos) for a CSP that called for sodium phosphate (NaPhos). The use of bar code scanning for verification during the compounding process would have prevented this error. Calculation error resulting in an incorrect dilution – A patient-specific order called for 20 mg of hydrocortisone in a total volume of 2 mL to be placed in a syringe for iv administration. The technician started by first making a stock hydrocortisone syringe from which to draw the dose. This is a common practice. The resulting stock syringe should have contained 100 mg of hydrocortisone in 10 mL of solution, i.e. final concentration of 10 mg/mL. Instead, the technician calculated the final volume as 25 mL, resulting in a final concentration of 4 mg/mL in the stock syringe. So when the patient-specific dose of 2 mL was drawn into the syringe the final dose was only 8 mg. The pharmacist almost let it go, but something made him take a second look. It was only when he asked the technician to explain the process that the error was discovered. The use of bar code scanning for verification during the compounding process would not have prevented this error. But, the use of step-by-step instructions with intermediary step checks during the stock syringe prep, or the use of gravimetrics, would have. The number of CSPs prepared in iv rooms daily in the United States is unknown, at least to me, but has to be somewhere in the neighborhood of a million. (2) Combine that with published literature that puts sterile compounding errors around 11%, (3) and that’s some scary stuff. With numbers like these, I wonder how many mistakes make their way to the patient? The iv room is a busy place with a lot of dangerous medications. It’s also a place where a lot of errors occur. With the availability of commercially available products that can easily prevent these types of errors, there’s really no excuse for continuing to use a completely manual process. (1) Syringe pull-back method is when the empty syringe used for each drug or electrolyte is left alongside the item with its plunger pulled back to the volume that was added. The pharmacist looks at the empty syringe with plunger pulled back and compares volume to the volume necessary to accurately prepare the CSP. This is common practice in many pharmacies even though it has been declared unsafe. I continue to be surprised that pharmacies use the syringe pull-back method. (2) Using a number of 1.5 CSPs per patient, per day in acute care hospitals, and using 795,603 licensed Community Hospital beds in the United States (1999 – 2013 AHA Annual Survey, Copyright 2015 by Health Forum, LLC, an affiliate of the American Hospital Association), the number of CSPs produced per day in the United States exceeds 1 Million. Since few people seem to be listening to us when we talk about the need for the use of error-preventing technology in the IV Room, I think we should try a different approach and make this a Patient Rights issue. This would certainly get Nursing’s attention, maybe a few physicians, and possibly even a hospital administrator. I don’t think everyone outside of pharmacy understand how problematic the current situation is. I think pharmacists are in denial when it comes to medication errors in the IV room. We’ve been doing the same thing, the same way for so long that we feel we are infallible. In that regard, I think we need to do a better job educating our membership that not all errors are the same. I just became aware of a document from the World Health Organization (WHO) that does a good job discussing the different types of human errors that can occur along with some examples (http://bit.ly/1PKZDma). (b) A lapse, if it is not observable (skipping a step in the process. (2) A failure where the intended action is the wrong one, a failure of planning resulting in a mistake. (b) Knowledge-based, when the correct course of action is not taken (a calculation error). Too many people think that all errors are “mistakes” (the second type above) and if we do a better job educating and training our staff, that we can avoid all errors. Unfortunately, as long as we utilize humans in the medication management process, we are prone to “human slip” errors (the first type above) that canNOT be prevented with education and training. Why? Because humans can make slip errors, like selecting the wrong vial of medication, and these errors could easily go undetected if not caught by another human or by using “machine technology” (i.e., barcode scanning, RFID) to confirm that the correct vial was selected. Likewise, humans can make Type 2 errors (mistakes) during the process of preparing an IV admixture. These also can be made more discoverable by using IV Workflow process automation like imaging and gravimetrics with remote checking capabilities. What I don’t understand is why pharmacy management has been so slow to adopt tools to prevent slips (i.e., wrong drug) and mistakes (i.e., wrong dose drawn up) during the IV Workflow process of compounding IV admixtures (CSPs). Even though less than 10% of hospital pharmacies are using any type of IV Workflow Automation systems (e.g., barcoding, imaging, gravimetrics) for all CSPs, more than 60% of pharmacy directors NO PLANS to introduce any mistake-preventing, IV Workflow Automation systems in the next FOUR years. I don’t get it. If error-preventing technology is NOT used, the only way to possibly prevent errors is to have a second person double-check EVERY step of the primary person preparing an IV admixture. But, even that is fallible, because it is possible to have two humans each make consecutive slip errors. The evidence for this is the deadly Bend, Oregon error where neither the technician preparing a fosphenytoin drip, nor the pharmacist checking the preparation noticed that a neuromuscular-blocking drug, rocuronium, was used instead of fosphenytoin. IV Admixtures (CSPs) are the most dangerous types of items dispensed from the pharmacy, because unlike other unit-dose items dispensed (e.g., tablets, capsules, vials, ampules, syringes, and other manufacturer-labeled products), the person administering the drug has an opportunity to notice if a dispensing error was made. That’s virtually impossible when it’s a clear IV bag! I think you make some great points, Ray. I don’t know how we will push technology updates in the iv room. The most interesting thing about my observation is that I spoke to the operations manager of the large acute care pharmacy was aware of the issue. He felt that they needed some type of semi-automated iv workflow management system, i.e. DoseEdge, BD Cato, Verification, etc, but couldn’t get buy-in from the Director. And what’s even worse is that the iv room supervisor didn’t feel that it was necessary. They were using the Epic module and disliked it. That experience put a bad taste in his mouth regarding the entire field. Thanks for your thoughtful comments, Ray. To quote you “They were using the Epic module and disliked it. That experience put a bad taste in his mouth regarding the entire field.” This is the problem now. This is what I have been saying all along that \ complex systems can’t do everything; but we expect them to. When the systems fail us we assume all systems will fail us and we fall back to old habits. This goes back to the suite versus best of breed. We are in the suite mode with EPIC, CERNER, McKesson, etc. They are good for IT departments because you just have to maintain one line of systems and get one bill each month. The more different systems you have even though a best of breed may be good for one specific workflow but may cause other issues like interface and maintenance problems. Unfortunately we are in the Stop Sign phase of healthcare at the moment. What I mean by this is if you drive around a city and see a Stop Sign in an odd place on a street that means there was an accident there. That sign wasn’t there before. The same way with IV’s. Too bad. Exellent article. As a nurse — this is so scary. Can’t imagine how I would feel due to an adverse event occurring with a drug I administered — even If I couldn’t have done anything to prevent.